Parents like us are concerned about everything that goes into our kids bodies. In all my years of day care and being a Mom, I've never seen a kid play in the water outside and not put the hose to their mouth for a drink, have you? 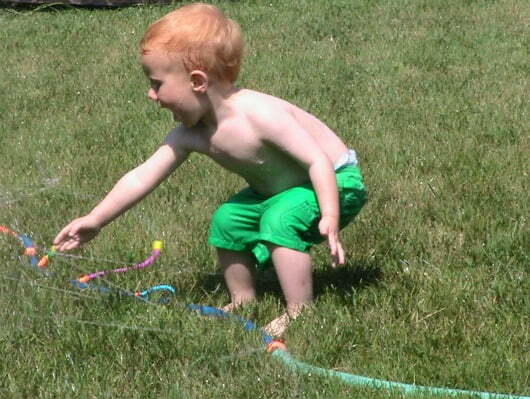 The Clean Water Fun garden hose filter was created for our toddler. He is a true water-bug and loves splashing in his baby pool and spending hours pouring and playing with water at his water table. We are very health conscious parents and only feed our children real food and clean water. From the drinking water to the shower and bath water, we filter everything to make sure our children are getting the very best we have to offer. My wife noticed our son taking a sip from the water table one day last summer and from that time on she would only fill the pool and table from the filtered kitchen sink water. This was very time consuming! We looked for products on the market to help us with this issue and were disappointed when we viewed what was available. We were also surprised to see that no one was talking about this. Millions of families filter their child's bath and shower water but the same dangers lurk outside in the kiddy pool, sprinkler, and other water activities. This product was created to fill a need for our family and we hope it will help many other families get some extra peace of mind as well. Since the launch of the filter this year, we have had customers contact us about using the filter for bathing and feeding their pets and organic gardening (chlorine can really do a number on the natural bacteria in the soil). We hadn't thought of these things originally but now we use our filter for just about all of our outdoor water needs. Get a Garden Hose Water Filter here. I’m not on FaceBook, but I would love to be entere in this “sweepstakes”! Looks like a great product. Every child would enjoy it and the parents would have peace of mind. I have this and love it! My 2 year old runs through the sprinkler with her mouth wide open. What a great product. I signed up for their email updates. Thanks! This I was reading about last week and wanted to purchase. So glad for the contest…Thanks! I also liked the page: https://www.facebook.com/pages/Clean-Water-Fun/291049157634905 … seems to be the only FB page that could be theirs… has 5 likes now ? Rafflecopter couldn’t link up to Clean Water Fun’s FB page. This is the page I used and liked: https://www.facebook.com/pages/Clean-Water-Fun/291049157634905 It only had 1 Like beside me so not sure what’s going on. Is this the correct FB page? This looks awesome AND what a great website find. Thanks!